Patagonia has been around since 1973 and in that time has become a respected, loved brand that has a hugely loyal fan base. Although they offer various outdoor gear products for cold weather, wind or simple light rain in your backpacking trips. From boots to backpacks and apparel for everything from extreme winter hiking to yoga, they are known famously for their jackets to stay warm during adventures. A common trend among Patagonia jackets is the quality and insulated features. The use of recycled and other eco-friendly materials, the complimenting fits and the numerous colors. Unlike many other brands that simply change the size of their men’s and women’s model jackets, Patagonia goes so far as to construct the women’s in a new shape that allows for better movement and a more slim fit. Another consumer benefit of shopping with Patagonia is their stance on environmental impact. Although you will see a “Made in Vietnam” tag on some of the clothing, such as this Patagonia Nano Puff Jacket, you can rest assured that it was made with the environment and the people in mind. Patagonia doesn’t just outsource the production of their clothing to a random factory. They actually have a few overseas companies that hire employees. 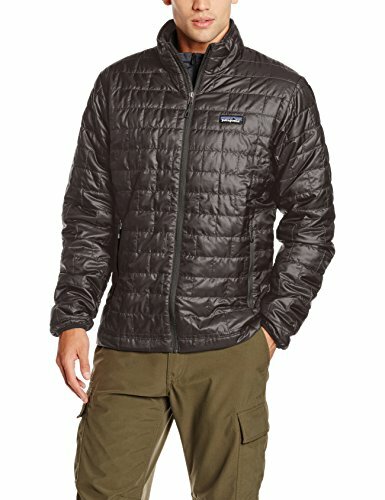 Patagonia is truly a great brand and their Nano Puff jacket is nothing short of awesome. This jacket was based on a Patagonia Nano Puff pullover jacket. Although the pullover was popular, naturally people really wanted the simplicity of a front zipper. Patagonia delivered. 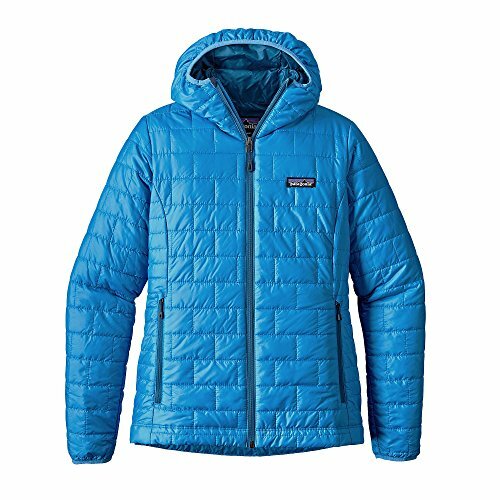 The Nano Puff jacket is one of Patagonia’s top sellers in their winter jacket category. It is highly praised amongst various outdoorsman and outdoorswomen for being tough, incredibly warm, durable and super thin. Patagonia made this jacket to be a real workhorse. This jacket has all of the best, most functional features a great jacket needs and none of the extra frills that just add weight. Now, let’s get into the main benefits of this ultralight jacket. Don’t let the thin, sleek appearance of the Nano Puff sweater fool you into thinking that it won’t be able to put up with whatever you have to dish out like a cold weather. The shell of this jacket is a super lightweight recycle polyester (1.4 oz and 22D) that is rip and tear resistant. Patagonia’s Deluge durable water repellent finish has been added to the shell which makes it shed water upon contact. It allows breathability and increased dry time in the event the jacket is soaked from snow, rain and other water while backpacking. The slick finish of the jacket also means you won’t have any trouble using this piece for layering, as it will let a heavier jacket or parka slip right over. Additionally, if you brush up against rocks, trees or other abrasive objects, the sweater jacket is far less likely to catch. Overall the Nano Puff is super versatile and can be used in any type of cold weather or winter condition. For truly bitter cold temperatures, you can easily use this as a middle layering piece if you add a parka on top. If you’re in a moderately cold climate, use the durable jacket as a top layer as somewhat of an ultralight weight parka to stay warm. Since this jacket is thin, you won’t feel extra bulky or cumbersome if you layer on it or under it. The jacket is certainly not stiff in fabric and the way it is structured allows it to move easily with the body. This means the durable Nano Puff is ideal for winter activities like hockey, skiing, snowboarding, hiking and more. Some people even go climbing in it- something the average winter jacket would cause you to feel constricted in. Like all of Patagonia’s jackets, customers new to the brand are often shocked at how warm their apparel really is, which makes it perfect for backpacking. The Nano Puff jacket is no exception. In order to keep weight and bulk to a minimum without sacrificing warmth in this ultralight jacket, Patagonia used a synthetic polyester insulation called PrimaLoft Gold (60 g). This insulation is the most thermally efficient one available. Not only does it repel water but it remains warm even if it is weight. It’s warmth to weight ratio is 96%. An added benefit of the PrimaLoft Gold insulation is its compressibility. As the built in stuff sack suggests, this jacket can easily be compressed down to an extremely small size and stored within this chest pocket. 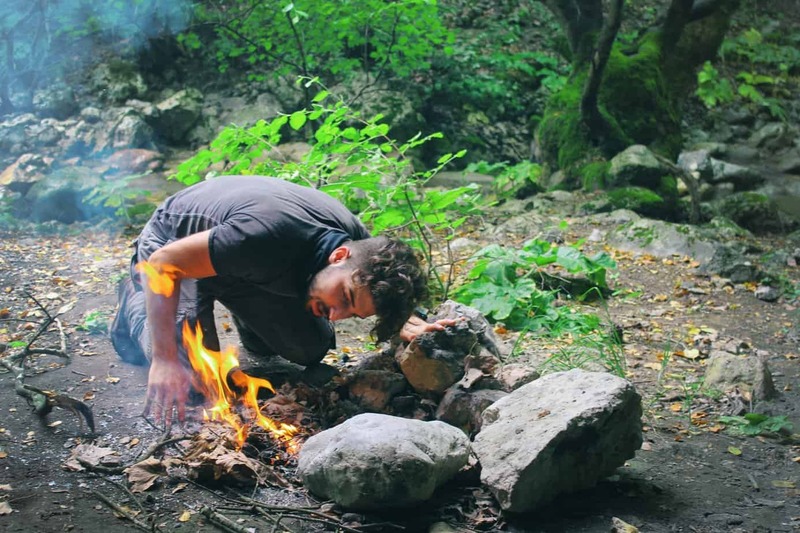 This is a huge benefit for those who plan to wear it while camping, backpacking or hiking. Its light weight and ability to be compressed make it especially ideal for backpackers that need to save as much space as possible. There is even a strong carabineer so you can clip it to a backpack. 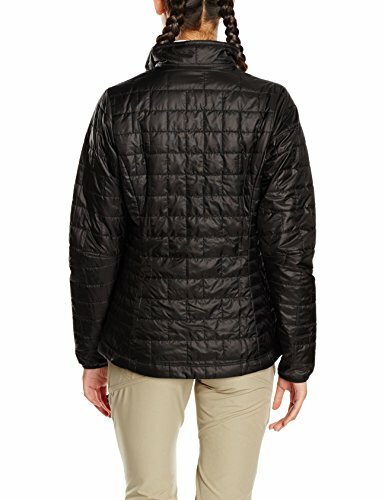 To keep the insulated plus in place and prevent pilling, Patagonia has this jacket stitched with a brick quilt pattern. The lightweight insulated jacket has separate quilted side panels for improved movement. All stitching is done with a special thread that is extremely durable yet lightweight. 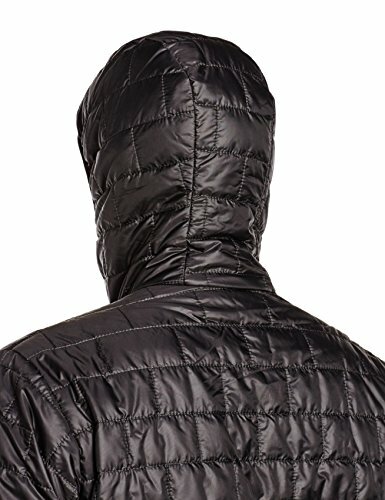 If you hate the feeling of a zipper poking or scratching your neck, you’ll be happy to know that Patagonia installed a zipper garage and as well an interior zipper flap. These keep the zipper off of your skin while the flap further prevents water or light rain from entering the jacket. The side pockets of this jacket also have zipper garages for comfort and to prevent snags. The Patagonia Nano Puff jacket is perfect for anyone that loves the winter wind but is tired of feeling chilly despite many layers or feels like they can hardly move because of overly thick traditional winter jackets and parkas. This jacket is super versatile, super warm, durable and available in a ton of awesome colors. If you invest in a Nano Puff you can bet that it will quickly become your go-to winter jacket. The Nano Puff wouldn’t be suitable for people who go through a lot of thick brush as over time it will damage the jacket even tough this synthetic jacket is durable. It also wouldn’t be suitable for super wet climates, like heavy rains, heavy snow or if you could potentially become wet from a river or swamp, it will funtion better in a light rain or wet wind. The Deluge water repelling treatment combined with the durable water repellent finish nature of the insulation is great but, remember, it’s only water repellent, not waterproof. If you prefer a pullover, they do have the same style of jacket available, called Patagonia Nano Puff Pullover. They also have a micro puff hoody version which would be great if you plan to use the Nano Puff synthetic jacket as a light parka or plan to wear it in an area that is wet or windy. 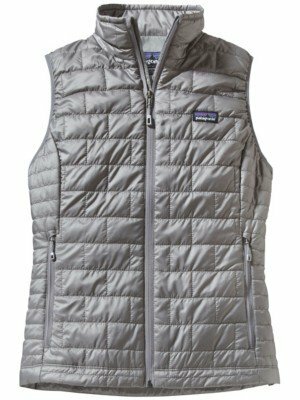 For layering in moderate or mild winters, a Nano Puff vest may be all you need to stay toasty warm.